I took heaps of photos today...both Fred & the flowers in the living room. That was just supposed to be a warm-up for the late afternoon. The beautiful big Academy is getting new life by becoming the "Lunenburg Academy of Music Performance". It has opened with a two-week Master Class for Opera singers, furthering their studies with Maestro Zedda, the foremost authority on Rossini opera and here from Italy. Some of the 8 students were from Italy, Canada, Hungry and the US (California), but all have been studying in Italy. Once more, there we sat, front and center, only feet from the singers, and marveling that we'd never have an opportunity like this back home! It was to have lasted an hour, but they continued for four hours, and I was mesmerized! The intent is to practice intensely for two weeks, and on the 25th and 26th, they'll perform 2 operas. I can hardly wait! So where are my photos? None were allowed this evening as they got underway. Tonight you get "Roses"... Bravo! Bravo! Fantastico! They are beautiful! I love their colour. the roses are lovely and the shot is very engaging. Not only do you have great opportunities in Lunenburg, but you and Ken take advantage of them. Thanks for taking us along! i agree with allison, take advantage of what is there no matter where you are. 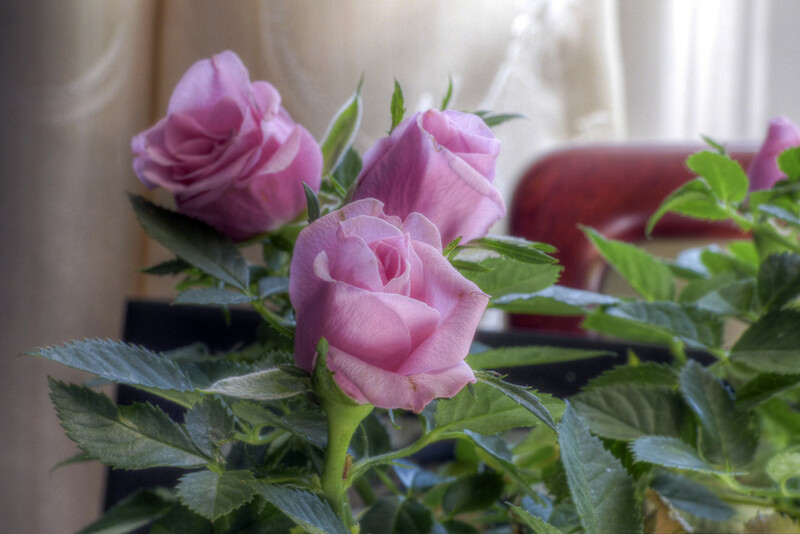 A great capture of those lovely and beautiful roses. you still talking of back home . I think you love it in Lunenburg better. Great event to have a great music day. Well these roses will do just fine as they are quite stunning. Wow, you do have some great places to see there. Another co-worker just came back from a cruise (Carnival) and where were they? Halifax, Nova Scotia. How close is that to where you are? I was so envious. She said it was a fun two days of walking around visiting all the various shops. @pyrrhula I said to Ken today, not so many years ago, did you ever imagine we'd be living in Canada and loving it as much as we do?! You can easily see how much we have to choose from here & we seem to know so many more people...so yes...we really really love our life here. We will return to California for the winter and all the time, look forward to returning! @Weezilou The best of both sides. Our neighbour is doing the same. We love it because it`s very quiet. @pyrrhula haha...our neighbors will likely be glad to see us go as well... I know there's been two months of saws and hammers out back... We have something to look forward to (a new deck)...they have something to look forward to...The noise will finally stop! I thought you would have the contractor doing work at your house while you were gone.....much to the chagrin of your neighbors! I bet you are the best people to live next door to, but construction noise is never fun. @ethelperry more to come...I've spoken with the people arranging the time for the students here, and they were very happy that I invited everyone to dinner (though dinners are all pre-arranged, so they'll come for lunch one day next week! We're so excited to get to know them! I've met & spoken with the young lady who comes from San Francisco, and she's delightful! She says the group is excited to come to a hiome for lunch (they stay & dine at a large inn in town). Whoopee! I don't know how I missed these gorgeous roses! Thank you so very much for tagging them with the thinkpink2014 tag. @janiskay Thanks Janice. It was only after I read Ethel's comment and saw how she had tagged her photos, that I added the tag to show my support as well. Day-to-day I'm not surrounded by a lot of pink, but I'll seek out something more and try to do it with purpose! @Weezilou @ethelperry Ethel, Louise says you're responsible for her tagging her picture thank you so much. Thank you both for taking part in this think pink 2014 challenge.